I’ve decided I’m going to (re)start my knitting career by making a dishcloth. Yup. How very glamourous of me. I thought about making a scarf, but I started it too wide to begin with and then I think I really need bigger needles to make it less… stiff. 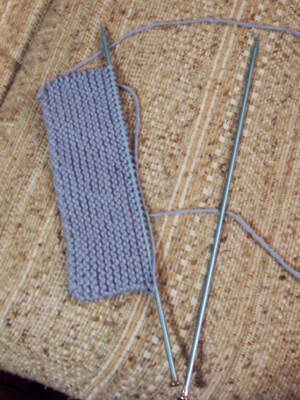 The needles I’m using are 7’s – I got them at Goodwill yesterday for $2, along with the yarn. They’re good for dishcloth-type-things, but nothing too loose or flowy. It’d be like trying to wear a scarf made of cardboard. Mouse status: seen once today, bringing the total sightings up to two. Daniel has yet to see it. When I saw it, I shrieked “A MOUSE! THE MOUSE AGAIN!” and it got scared and ran away. Again. You should try getting some 16’s. Those were the first size of needle I ever had and they’re freaking HUGE. Think railroad spikes. 16’s?!? They’d be GIGANTIC! I have an 11 (it came with the 7’s, but there’s only one) and it looks huge. I can’t even imagine trying to knit with 16’s.